Soul Eater Soul Art is the artbook for the Soul Eater manga series that debuted in 2004. Since then, the manga has spun-off into an anime series and video games. 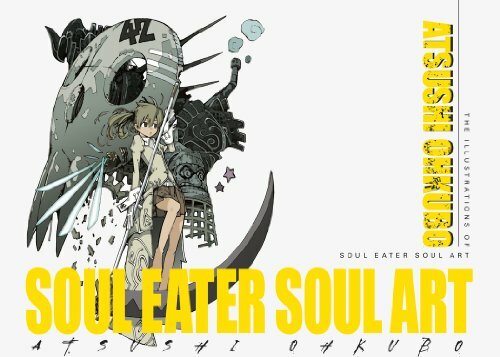 This book is actually the English translated edition of the original Japanese one 大久保篤 画集 SOUL EATER SOUL ART released in 2009. It's a beautiful wide 112-page hardcover book that comes with a nice plastic slipcase. The overall package looks classy. The paper is thick low gloss and the binding is good. Inside, it features the illustration art of creator Atsushi Ohkubo (大久保篤). The content is a split between full page artworks and character profile art. The art is beautiful and I really love the graphic style, and there are a few styles. There are the comic-like colour illustrations, those that you can tell are created with traditional media. There are also the more graphic illustration style that features flat colours, much like anime-style colouring, but you know those pieces aren't drawn for animation. Then there are a few loose pieces with more fuzzy line art. The characters are great, the poses, as well as the background settings and composition. The wide landscape canvas really displays the art as large as possible and they look great at big sizes. There are also some character designs for the game Soul Eater: Monotone Princess. The back of the book contains the index which has short commentary for some of the pieces. Highly recommended for Soul Eater fans, or if you like manga art.